The Welsh Terrier originated in North Wales during the 1760's and were primarily used to hunt foxes, otters, badgers, and small rodents. They are descended from the Black and Tan Rough Terrier and the Old English Terrier. The Welsh Terrier was recognized into the English Kennel Club in 1886. 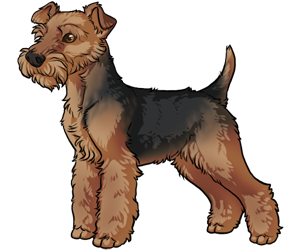 In 1888, the first Welsh Terrier was brought over to the United States where it was then recognized by the American Kennel Club. Was first shown in 1901. Often mistaken for Wire Fox Terriers and miniature Airedales.